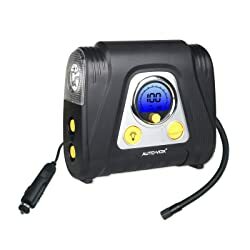 Having a portable 12V Air Compressor available when your car’s tire pressure is low can save you time and money! Most of us know you can damage an expensive tire by driving on it while under-inflated – or worse yet, it can damage a wheel. 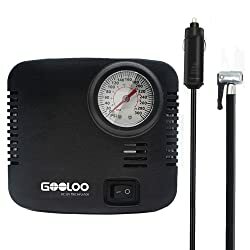 A quality Portable 12V Air Compressor could save you from spending a cold lonely night in the wilderness if your ATV or dirt bike has a tire low on air. Tires can lose air pressure for several reasons. The most obvious is a leak but the air temperature can cause the pressure to drop when the mercury goes South. As the air molecules become colder they become less active requiring less volume, causing your tires to go soft or flat. Many of the 12V Portable Car Air Compressors being sold are junk! Those poor quality compressors are not reliable, usually very loud, and very slow to inflate a car tire. You’re better off with an old fashioned bicycle hand pump. 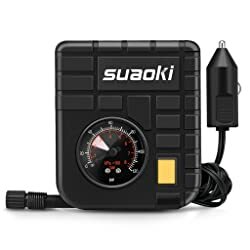 Not only is it a smart idea to have the Best 12V Portable Air Compressor in your vehicle in case of emergency, its a great idea to carry one in your boat. 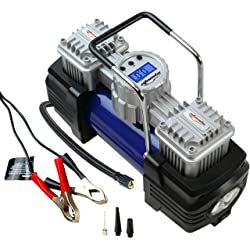 A 12V Air Compressor is great for inflating rafts, tubes, and other marine or sport inflatables. A 12V Air Compressor can give you the opportunity to be a “good Samaritan” if you spot a motorist with a flat tire. Just knowing you have one handy gives you a sense of security. Features to Look For in a 12V Air Compressors for Cars! Like most products, not all 12V Air Compressors are created equal! Here are the features I believe are important to look for when selecting the best one for your needs. Make sure the Maximum PSI Rating of the 12V Air Compressor will meet or exceed the recommend Inflation PSI of your vehicle. Easy-to-Read PSI Pressure Gauge. 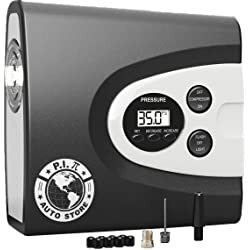 Both LED Digital or Analog Dial PSI Gauges are Accurate for car tires. Screw-On Air Chuck for an air-tight connection. You will lose a little air when removing so its wise to inflate a pound or two above your target PSI. 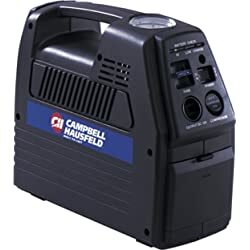 A CORDLESS Rechargeable 12V Air Compressor makes a lot of sense like the Campbell Hausfeld (CC2300 (See BELOW). 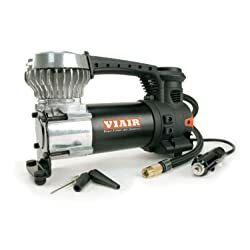 Another option is a Compressor that attaches Directly to the Battery Terminals like the Viair 88PEP or the Auto 12V Duo Power Portable Air Compressor Pump that comes with Alligator Clamps (See BELOW). That way you don’t need to worry about blowing a fuse. Even the Best 12V Air Compressors have these Issues! Relatively Slow Inflation should be expected because of the small size. A 12V Air Compressor simply does not have the CFM (cubic feet per minute) capability of a full-size air compressor. Heat is generated when air is compressed by any air compressor. Make sure you only pick up the Compressor by the handle to avoid burns. Check your car’s 12 Volt Outlet or Cigarette Lighter Port to make sure it meets or exceeds the Portable Air Compressor amperage rating. Some vehicles have 10 amp fuses so a 12V Air Compressor rated at 12 or 15 amps would blow the fuse. What About CORDLESS Air Compressors or Inflators, like the ones on TV? Because Cordless Gadgets have become so popular such as cordless vacuum cleaners, some unscrupulous marketers are advertising Cordless Pumps or Compressors on TV. Their only intention is to seperate you from your money or get your credit card #, so BEWARE! 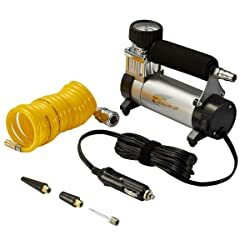 The ones I have looked at are just plain junk, like the Air Hawk Compressor. My advice is don’t order an unknown product from an unknown company or seller. 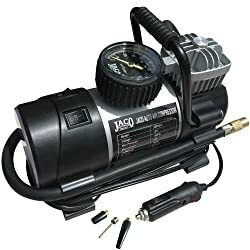 If a Cordless Compressor, Inflator, or Pump is what your looking for I recommend that you stick with well established reputable manufactures and sellers. For example, the Ryobi P737 18-Volt ONE+ Power Inflator is an outstanding pistol grip type Cordless Inflator. It is sold as a “Tool Only” which means you would need to order the 18 Volt Lithium Battery and Battery Charger separately. The combo is more expensive than the Air Hawk but it will give superior performance. Plus, you can purchase other Ryobi tools that use the same battery, so this is a smart option. Or, check out the Campbell Hausfeld Cordless Rechargeable Inflator available from Amazon (Listed Below.) It is Cordless and comes with a 12V Adapter so you can charge it from your car’s cigarette lighter receptacle and then use it cord-free. That’s a good, solid product that will do the job you expect it to. 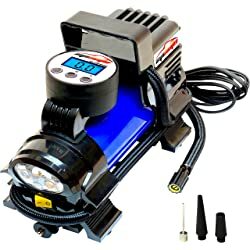 The 12V Air Compressor I Selected for My Cars and Inflatables! 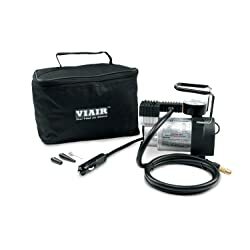 After a lot of research and reviews I decided the VIAIR 85P was the Best 12V Air Compressor for my needs and Here are the reasons why! 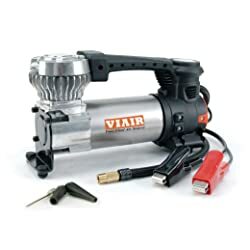 The VIAIR 85P Portable Air Compressor is built very solid. The compressor body is made of machined cast aluminum. The handle keeps your hand away from the body so there is no issue with the heat. It has a 1.26 CFM Free Flow Rate@ -0- PSI and will inflate an average size tire in minutes. The maximum working Pressure is 60 PSI which good for most applications. There are rubber caps underneath so the VIAIR 85P will set solid on any terrain. It is rated at 15 AMPS so you need to check your vehicle to make sure the 12V Power Outlet has a fuse of 15+ Amps. Its a little bit large to store in the dash or glove compartment for most cars. 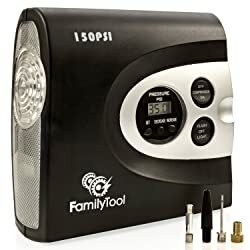 The price is higher than most portable 12V Air Compressors I looked at but considering the quality and features I believe it’s worth the price! More of the Best 12V Air Compressor RECOMMENDATIONS! 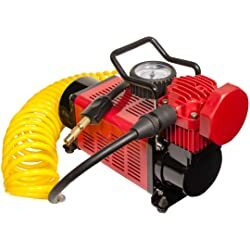 In my research, looking for the Best 12V Air Compressors for my cars and other vehicles, here is my list of the ones I believe are the best! 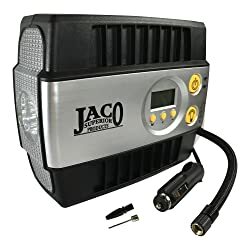 I prefer the larger/heavier type like the VIAIR 85P, but you may prefer the smaller/lighter 12v compressors like the popular JACO SmartPro so you can stow it in your glove box or under the seat. Make sure you check the specs to see if it is compatible with your vehicle’s 12V Power Receptacle. ← Meal Bags for Women Bodybuilders!